The report was authored by DataHaven's Mary Buchanan, Erica Pandey, and Mark Abraham. Use the button above to download the report, or click here. This report assesses numerous indicators related to civic participation and community engagement in Connecticut. Gauging the current state of civic health in Connecticut, this study follows the research reviewed in the 2011 Connecticut Civic Health Index Report and compares Connecticut’s current civic health to previous years and to the civic health of the nation and other states. By this report’s measures, Connecticut exhibits relatively strong civic health among its residents, many of whom help to resolve local problems through volunteering and leadership opportunities. They build close-knit communities, with most people frequently connecting with neighbors and staying in touch with friends and families. A majority of Connecticut adults are confident in institutions like public schools, and many adults also voice their public opinions through discussion, voting, or other means. This report also identifies areas where civic health falters, such as relatively low statewide voting rates. Further, differences in opportunities for civic participation exist between groups of people. In some cases, differing participation rates may result from deep-rooted, structural inequities based on socioeconomic status, race, or other demographic characteristic that prevent many Connecticut residents from participating more actively. By some indicators of civic health, Connecticut residents demonstrate significantly stronger levels of engagement than the national average, participating in higher rates in volunteering, attending public meetings, charitable giving, talking with and trusting neighbors, voting in local elections, and having confidence in the media or public schools. However, compared to other states, Connecticut performed relatively poorly in other measures of engagement, including registering to vote, belonging to a school or community association, joining a church group or other religious group, and having confidence in corporations. Rising participation in recent years in some activities — working with neighbors to fix community issues, contacting public officials, eating dinner with family, talking with neighbors — fuels improvements to civic health in Connecticut. But civic engagement has fallen in other areas such as volunteering, charitable giving, belonging to an organization, voting in national elections, and exchanging favors with neighbors. Meanwhile, overall participation rates mask gaps in civic participation between groups of people. In fact, demographic and socioeconomic characteristics define trends in participation in civic activities. By many measures, high-income and college-educated adults demonstrate better civic health than adults with lower income or levels of education. Participation rates, based on income or education, vary most widely on indicators of voting and volunteering. In general, involvement in civic pursuits increases with age. The youngest adults have lower participation rates than older adults in nearly all measures of civic health and are particularly less involved in the electoral process. If adults 18 to 24 years had registered and voted at the same rates as older adults in 2012, the number of voters in Connecticut would have increased by around 100,000. By most civic measures, participation varies between racial and ethnic groups, but white adults are the most civically engaged. African Americans also demonstrate strong involvement in community groups and political action. All adults connect with family and friends at equal rates. 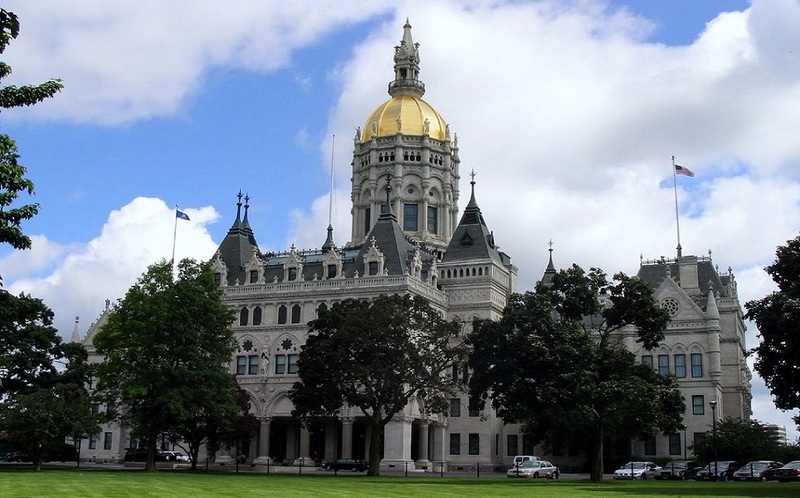 This report provides an overall evaluation of civic health in Connecticut, highlights measures in which Connecticut performs strongly, and brings attention to areas that could be improved. Identifying when and for whom low participation exists and understanding why it occurs are crucial for policy makers and community leaders who seek to build stronger civic health for each individual and town throughout the state. Read the full report for more information on civic health in Connecticut (the graphics here are an excerpt from the report). The report includes findings from the 2015 DataHaven Community Wellbeing Survey as well as other sources.